The December update of Clockwork Empires is now live, complete with a trailer illustrating a new and interesting way for things to go terribly wrong in your poorly-located Steampunk colony. The December update introduces new Naturalist behavior that will have them explore, study nature, and find artifacts—not necessarily a good thing—and adds laboratories and Scientists to study them. In a possibly-related development, you may also notice that your colonists start transforming into monstrous creatures under certain circumstances. As well, buildings and modules may now be dismantled, and you can use prestige to call in supplies, skilled workers, or (if you have no prestige), extra criminals. "These don't feel at first glance feel like 'positive' feature developments, but what they do is introduce the essential element of iteration," Gaslamp Games wrote in its development progress report. "Alongside this we wanted to introduce some fun themed gameplay elements, so we've fleshed out the behavior of Naturalist characters, added the Laboratory along with Scientists and Laboratory Assistants to work in them, and sprinkled the world with Strange Artifacts to discover, study for prestige, and possibly (probably) make things go Terribly Wrong with." A number of smaller fixes and changes are also included with the update—you can see the full breakdown here—and of course there's this trailer, which is my favorite part of the whole thing. 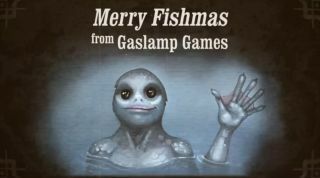 Merry Fishmas, everyone!